BEFORE: Today marks the beginning of the end of this documentary chain. 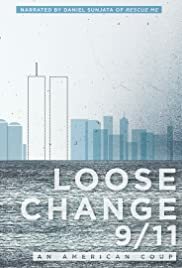 To wrap things up, I’ll be watching six documentaries about the United States starting with today’s film, Loose Change 9/11: An American Coup. AFTER: Not since I saw my last Michael Moore documentary have I been subjected to such obviously biased and distorted opinions. The whole thing is a conspiracy theory trying to convince the viewer that it was not Al Qaeda who organized the 9/11 terrorist attacks, but rather our own government. At times it was quite amusing the ideas the film presented as “fact”. One of the most outlandish theories that supposedly supports this conspiracy is that little to no wreckage of the planes were found at the crash sites (World Trade Center towers, Pentagon, and the field in Shanksville, PA). The film tries to argue that since no wreckage was found, the whole thing must have been a setup. The filmmakers go on to cite multiple precedents of plane crashes that left debris and claim that the crashes during 9/11 were unprecedented. Well of course they were. An event like 9/11 had never happened before and is therefore, by definition, unprecedented. But I digress. I’m sure many people believe this crackpot theory. In fact, there’s a whole movement that believes this. And I’m not trying to say the whole film is fake. Just like with Michael Moore documentaries, I felt as if this were extremely hyperbolic. Some small truth probably lies deep inside the crevasses of Loose Change 9/11: An American Coup, but as a whole, it is completely unfounded. If you’re one of those insane people who think we didn’t land on the moon, this film is right up your ally. But as someone who likes to live in a world that takes facts and both sides of a story into account, this was not an entertaining film to watch.